Finishing out the Imagitoons Zoo Reptile House is the swatat (sw-at-at) turtle. Visitors always compare this creature to the Star Wars "AT-AT" vehicle, for obvious reasons. 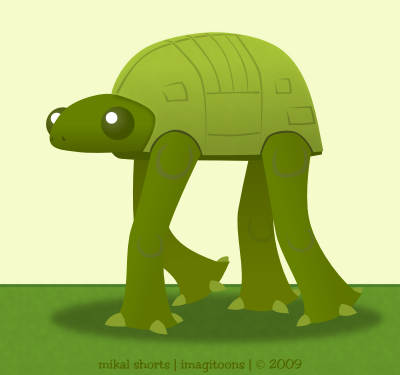 In truth, it is a good comparison because as few people know, the "AT-AT" was modeled after the swatat turtle! Swatat turtles can be very menacing as once full grown they can stand nearly 4 ft (1.22 m) tall! Swatat turtle legs alone can grow up to 3 ft (0.91 m) long!! These creatures are dwindling in numbers because their legs are seen as delicacies in remote parts of the world. The turtles that do remain stay in groups, wandering across open fields in search of a nice shrubbery lunch! Well kiddos, it's time to hit the Aviary!! See ya Monday!